THIS IS JUST A SAMPLE OF THE MANY SERVICES WE OFFER! set the celebration atmosphere! They will float all over the room and reflect the colored lights bringing more personalization and crowd interaction to your event. We feature video screens from 4 foot indoor screens to 40 foot inflatable outdoor screens. Have the best Sporting event party or movie night in town. Our entertainers can even play music videos while your guests dance the night away. HD Video Camera rentals and live switch capabilities take you event to the next level. If you can provide the location, we can even bring back the days of the drive in movie! Our graphic arts department can design a logo or layout to suite your event. Have individual or group photos made in to keychains "live" during your event. Fantastic for school functions and anywhere you want a special touch. We provide everything...props, backdrops, lighting just smile and say PARTY! We can create a custom lighting package for your event, any size from mild to wild. 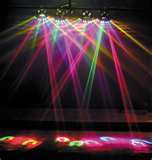 We feature the latest in LED lighting technology and professional robotic lighting from MARTIN. Mirror Balls, Strobe Lights, Black lights, rope lighting, Up lighting and wall washes, just to name a few. Contact us today and let us design a package for your event. We also offer trussing and support systems for any lighting project. Not enough power at the venue? We can provide you with professional, quiet and fuel efficient generators and power distribution systems of any size. 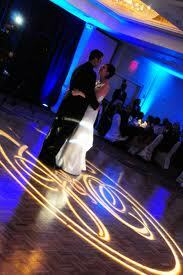 Dazzle everyone at your wedding as you dance the night away on your personalized monogrammed dance floor. 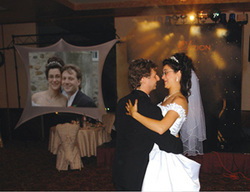 DJ LeRoy can help you personalize you wedding reception by making a custom gobo that will project onto your dance floor, wall, tent roof,o rjust about anywhere. Our professionally trained graphic designers will help you choose the perfect gobo for your event. If you already have a monogram, logo or a graphic from your invitations for your event we can work with that also*. Once the big day arrives one of our lighting professionals will deliver and install your light and position your gobo perfectly. Whether you choose the elegant black and white gobo, greyscale or the premium full color gobo, Gobos To Go is there to satisfy. 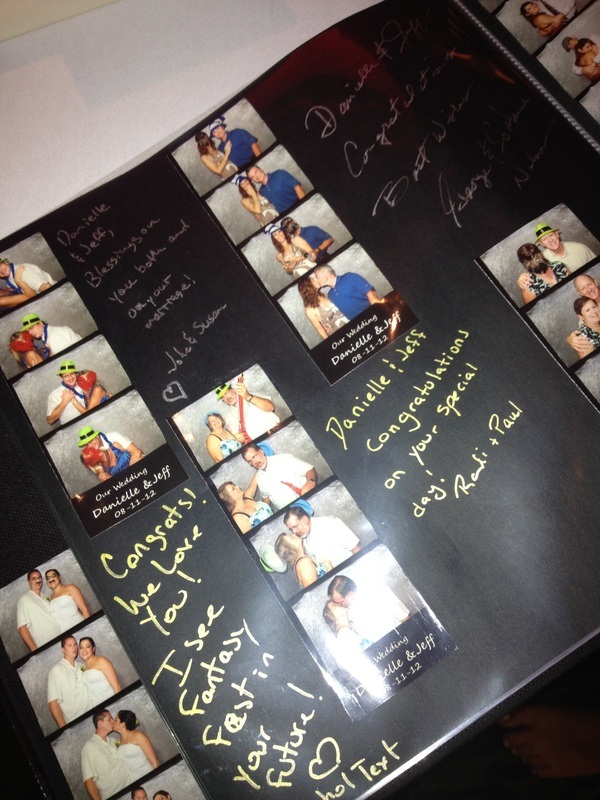 We pride ourselves on making your special day a day everyone will remember! The special memories video creates the excitement and backdrop of your experiences leading up to the wedding. The special memories video also works like a dream for birthday parties, Bar/Bat Mitzvahs and retirement or anniversaries. The show can feature individuals or groups of people. You may choose your images or video and the soundtracks to accompany them. DJ LeRoy will then project your show on large wide screens for all of your guests to see in brilliant color from either backlit or forward projection units. Our special memories video can also be mailed to you if you would prefer to project the show yourself by using your own projection unit or by using a domestic home DVD player and TV. We can cater for all events no matter how large or small and you can order the special memories video either with or without our Professional DJ service. Storytelling is one of the oldest forms of communicating and entertaining. With the personal documentary special memories video you, your family, and all your wedding reception or party guests will witness a truly memorable production. It will captivate. It will stir your emotions. It will get the room buzzing. This is not a photo montage. It is so much more. We combine your photographs and video clips and produce professional video/graphic artwork. You receive the finished program in a stylish DVD case personalized for your event. The result will make your guests laugh, cry, and will remind them why they were invited to share your special day. This is your personal documentary…artistically compiled by DJ LeRoy. It’s a great conversation starter and a terrific way to share all those thoughts and emotions words fall short with. Use it to open your reception activities, close the event, or both. The production time can be quite long depending on demand so book early to secure your special memories video. Think you have what it takes? Add karaoke to any event booked with us, or plan a karaoke night with friends. We offer over 45,000 titles to choose from. Hard to say, even harder to put down. A twist on the classic, we combine karaoke with the wildly popular "Rock Band" video game mixed into a professional sound, lighting and video experience. A truly unique entertainment choice for your next event!! We can place the image of you and your guests into any of our thousands of digital backdrops. You could photographed at the Eiffel tower and standing on the moon in the same night! The papparrazi won't be able to keep up. Packages great with the photo keychains. Fantastic with themed events, coroporate functions, birthday and holiday parties and so much more. Combine this with our professional photograpers and you are guaranteed great memories. Call Dj LeRoy today to discover how you can add something exciting and sensational for next company or corporate event. 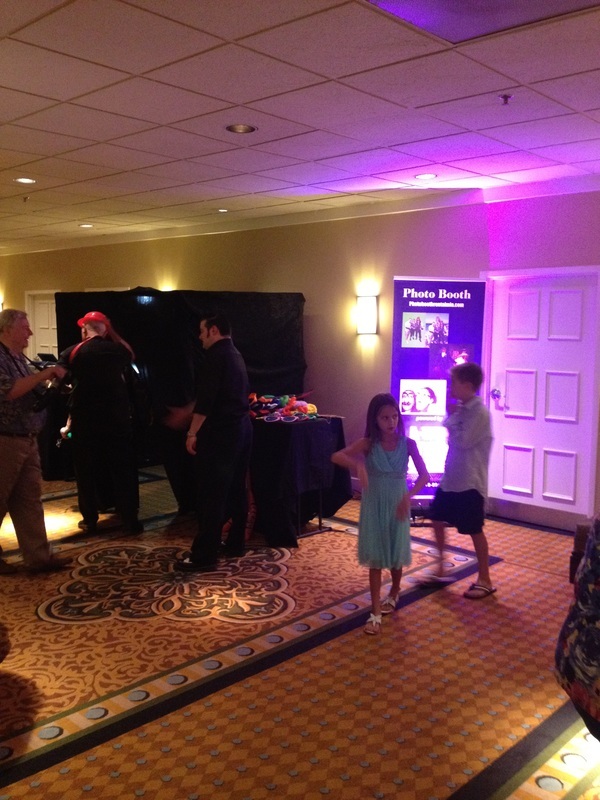 Our mobile contestant lockout buzzer gameshow systems are commonly used for Birthday events as well as all corporate training and social gatherings. Our Game Show systems are a collection of presentation software to create fun and increase the game show mania experience. Available software programs are game shows in the styles of Jeopardy, Hollywood Squares, Street Smarts, Family Feud, Wheel Of Fortune, Battle of the Sexes, Who Wants To Be A Millionaire, and more. It has everything you need to make your event a great success; music, sound effects, ring in buzzers with lock out features (first team or player to ring in locks out the other players), and automatic scoring.